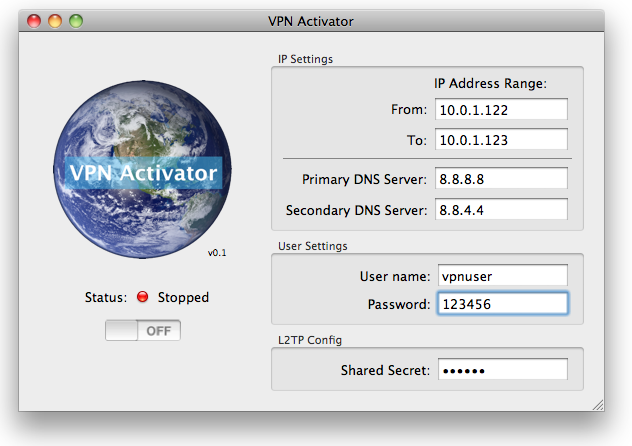 I just completed what appear to be a functional VPN Activator application. This is very early release and is more like a proof of concept. There is no guaranty that it will work for you. For now this release is probably only going to work on Snow Leopard 10.6.x. So if you are curious and adventurous, if you want to help me shake out the bugs then this is for you. You can do this by contributing in the Forum. You can download version 0.1 right here. 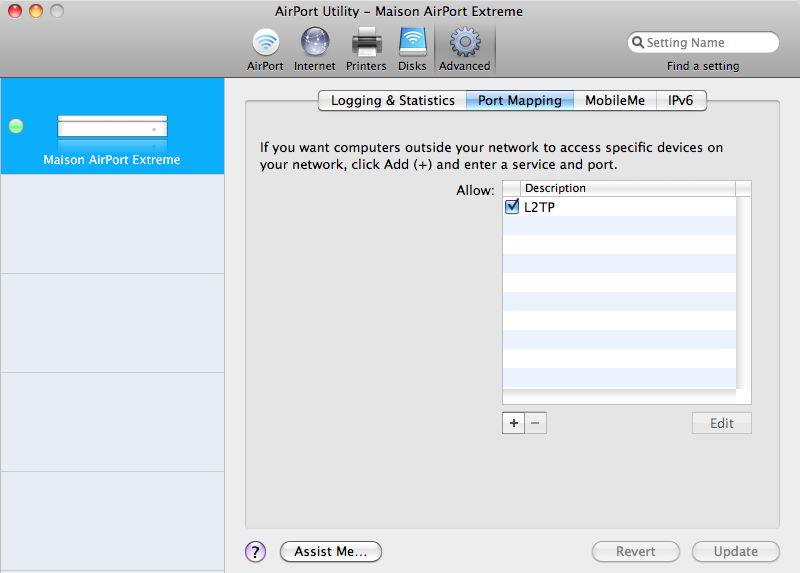 The application will create a L2TP VPN server on your Mac. All files necessary to do this are already on your Mac… so no Apple files are distributed through this application. 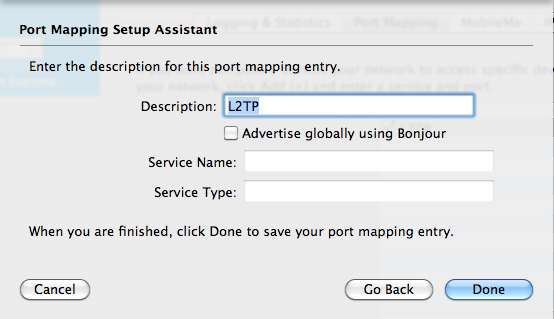 Given that you properly configure you internet router to allow L2TP across to your Mac you should be able to connect to your home network via your Mac running “VPN Activator”. Here is a short step by step on how to get the application to work if you have a Mac running Snow Leopard and an Airport Extreme internet access gateway. 5. Configure the desired VPN Shared Secret. Pick something hard to guess. 6. Click on the ON switch to save the config and start the VPN server. If all goes well the server should start. For now my status check routine if really dumb and does not actually check if the server is running… so don’t rely too much on it yet. 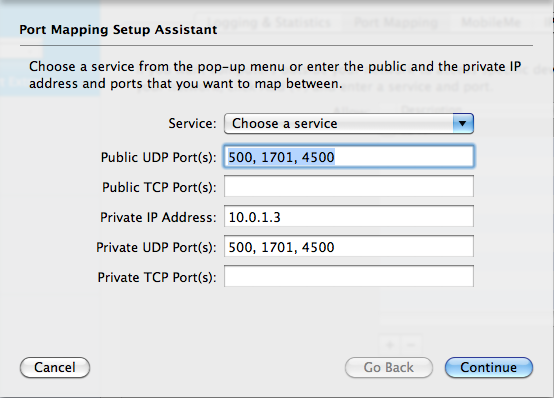 Also, I am not doing any IP address range validation… so make sure there is no typo or the server won’t start. Once the server is started the configuration fields go inactive until the server is stopped and changes can be made. 8. COnfigure your iPad or iPhone to use your Mac as a VPN. I will eventually write a full guide for this… but for now take note that your will need to find out what is your external IP address on the internet… you can use http://whatismyipaddress.com/ to help you find it out. 9. Configure the VPN and activate. You should now be connected to your home network.